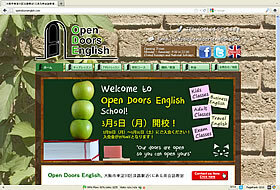 English language school based in Osaka, Higashiyodogawa. Hesitant before committing yourself to an expensive outlay? Don't be! It was by chance that I stumbled upon Website Design Japan. Best bit of luck I've had in a long time. The folk there, especially Jeremy, went the proverbial extra mile in ensuring I got everything I wanted in a website, and then some! Throughout the design process, I chopped and changed like nobody's business. I approved one design, then in hindsight, asked for it to be undone for something radically different. During this time, not a word of dissent nor refusal was heard from Website Design Japan. No deadlines were set by them. No last chances were given. Not once was never mentioned. They complied with everything I asked of them. What I appreciated most was the financial transparency. Every cost was explained and accounted for. Suggestions on keeping costs down were given. I was never pressured once into making a payment of any kind. Correspondance between myself and Website Design Japan was numerous and swift. It would be the case that I would mail them in the afternoon or early evening. If I never got a reply back that evening, I knew that when I opened my mail next morning, I was guarateed a response. Going forward, I fully intend to continue using Website Design Japan for all my website needs. They've earned my complete and utter trust. Don't waiver or ooh and ahh about choosing a company to build you an effctive, eye catching website. Just give Website Design Japan a call. You won't regret it.